Family owned & operated from the office to the field. 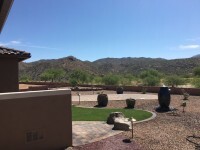 Having worked for a number of other landscape companies over the years, owner Dana Marchus was tired of the cookie cutter landscapes without quality or efforts to make sure the clients visions were really implemented. So in 1998 Dana left his previous employer & set out on the journey of starting his own business with quality & customers visions at the forefront. Nearly 20 years later & thousands of completed & unique projects, Dana still works side by side with his sons in the field to ensure customers get what they want & more! Adding artificial turf to a new or existing landscape creates a beautiful & easy to maintain green space! 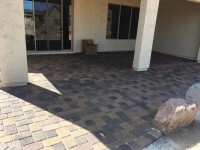 Bring an old concrete patio back to life with Belgard overlay pavers. Add color & pop instantly to your backyard! 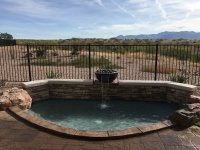 We can design a custom water feature to fit any budget & any size yard. Have the peace & tranquility of a water feature designed just for you! 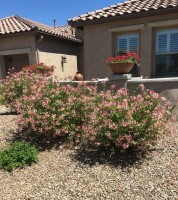 Adding pots with annual flowers is an easy & low maintenance way to add color to a new or existing landscape design!